Ginsu Knives always had the most convincing commercials. The other day someone mentioned Ginsu Knives and this vision of a man's hand karate chopping a tomato came rushing back to me. Ginsu were serious knives that could handle anything. They could slice and dice anything in, not just your kitchen, but your garage. Tin can? Lead pipe? No problem. If you were a '90s child you were still exposed to the tomato karate chop, but a shoe and a pipe are also sliced with ease. Remember this commercial? Check it out. Did your parents own a Ginsu? I never knew anyone to actually buy them, but years later my husband bought the Ron Popiel Six Star Knives. Ron Popiel was part of the original Ginsu crew, but sadly in 2007, Ron filed Chapter 11.
my parents didn't own a Ginsu, but I remember the commercials - annoying! 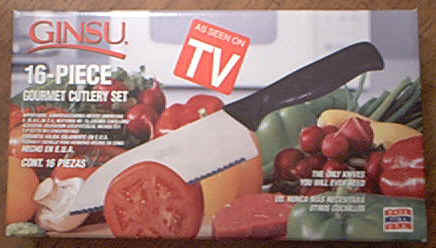 Never did own a Ginsu knife, but I certainly remember the commercials. And the Ron Popiel ones, too. The Original late night infomercials! YES! I still quote Ginsu commercials to this day. "Cuts through a tin can... slices a tomato with ease!" Hahahha! Amazing! I always remember thinking, "Why would you cut your shoe, and then go on and cut a tomato? That's gross". I never knew anyone who owned those knives. Omg I remember this, I'm a 90's kids but I totally remember how fascinated I was watching this. OMG I remember this so well! I'm a 90's kid and I remember how fascinated I was while watching this. Land of the Lost - Chaka!